Harvey was recognised as one of the top 50 players of all time in The Australian Game of Football, a book commissioned by the AFL in 2008 to celebrate the 150th anniversary of Australian rules football. The list was compiled by Herald Sun journalist Mike Sheahan. Harvey was known for his running ability and considered one of the best short passes of 15 to 30 metres in the history of the game. He holds St Kilda’s record for most career games. At his retirement, at the end of the 2008 AFL season, he had played the third-highest total career games in league history, a total of 383 games. Harvey won numerous individual awards and medals during his playing career. 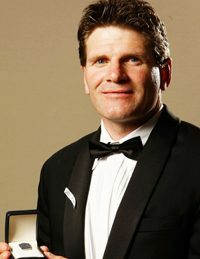 He won consecutive Brownlow Medals, the league’s highest individual honour, in 1997 and 1998. He won St Kilda’s best and fairest award – now called the Trevor Barker Award – in 1992, 1994, 1997 and 1998. He was selected in the All-Australian team eight times, with his first All-Australian award being in 1992 and his last in 2003. With that pedigree its no wonder he is one of our most in demand AFL speakers.